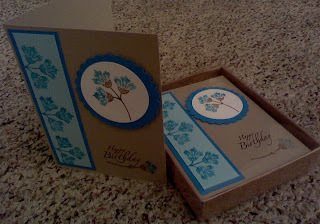 I particpated in another birthday swap, which I heard went postal today, so I thought I would share. I find it hard sometimes to make birthday cards, for all kinds of people. Having other ideas in my basket helps get the creative juices flowing... so why not swap. I like seeing what people put together with sets I may or may not have in my collection. And the color combinations sometimes help too!! This set I was ready to make birthday cards for a craft bazaar, but I haven't heard if there is space available - so in the meantime I swapped out some cards I produced.